A cross between a whiskey sour and a Last Word, the Paper Plane's skyrocketing popularity has landed it on cocktail menus around the world. Milk & Honey alum and proprietor of Attaboy, Sam Ross, is the brain behind this modern classic. 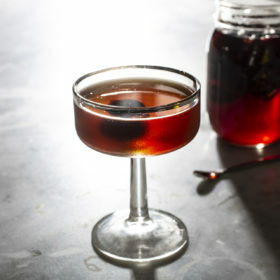 Bourbon-based and firmly in the whiskey sour category of cocktails, the herbal notes provided by the Amaro Nonino and equal-parts preparation of this drink also bring to mind the much-revered Last Word. In the 10 years since its creation, it has gained notoriety among a wide number of bartenders, and can now be found on cocktail menus worldwide.